1. Start by making sure your chosen jar is both clean and dry. 2. Measure the width of your jar and cut a strip of First Edition Pick n’ Mix paper to fit. If you’re upcycling a larger jar, simply cut another strip to attach to your first strip. 3. Next, die cut the sweet wrapper die in random places across your strip. 4. Wrap your strip/s around your jar and use Dovecraft Perma Fix tape to secure it. 5. Die cut the other sweet die designs on to complementing sheets of Pick n’ Mix paper. Adhere them along the strip with 3D foam squares. 6. Next, cut out a rectangle from a coordinating sheet of paper from your Pick n’ Mix paper pad. Create the tag shape by cutting off the two top corners of your rectangle. 7. Punch out a hole at the top of your tag and die cut the word ‘Sweets’ using the First Edition Alphabet dies on to a contrasting sheet of Pick n’ Mix paper. Adhere the letters to your tag with 3D foam squares. 8. Stick on more sweet die cuts to your tag with 3D foam squares, ensuring to use a variety of paper designs for your die cuts to add interest. 9. Thread your tag through a length of Dovecraft ribbon and then wrap it around the top of your jar, making sure to securely tie it. Even Willy Wonka would be impressed with this sweet jar design! For a celebratory make, you could make an exploding box card bursting with different First Edition Sweet die designs. 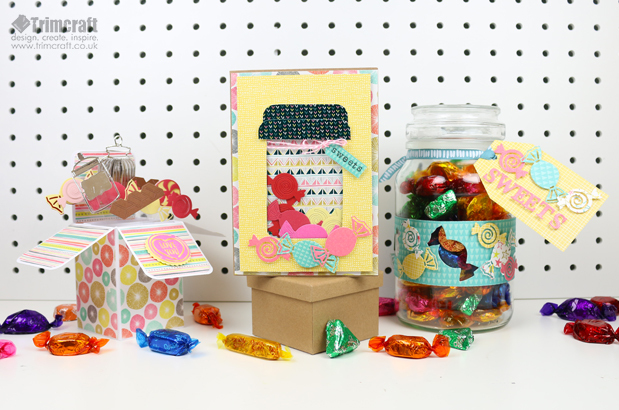 This craft is perfect for those with a sweet tooth and the decorative Pick n’ Mix papers will make your project really pop. This delicious First Edition dies set is a must have! How will you use these fab dies? We would love to see your versions so remember to upload them to the inspiration area and to #Trimcraft when uploading to social media.